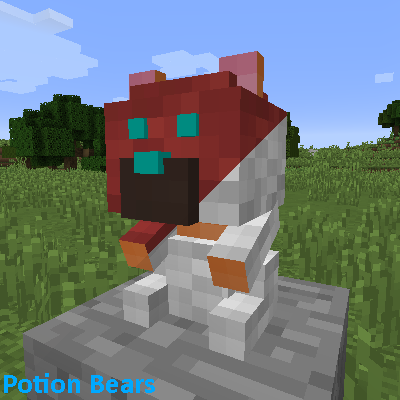 This mod adds 16 Bears that each give a different Potion effect. When the bear is placed or first activated it will face towards you. Sneak + Right Click to turn it towards you again. In order for it to do something you must first right click it with a diamond. Only after you activate it with a diamond you can click it again to gain a potion effect. If you break the bear, you get the not activated bear back. You will then have to activate it with a diamond again. Just wandering about multiplayer. Is a single bear useable by multiple players, or are they locked to one player, or does the second player supplant the first as beneficiary... etc. As soon as a bear is activated, it can be used by all players infinitely, or until the bear is destroyed. It will then have to be activated with a diamond again. An extremely popular yotuber did a mod showcase of this and a few other mods, your mod was the first one, I only like your mod and the last one showcased on his video, conclusion: thank you so so much for this mod and I wanna mention I want to work with you one day!!!!!!!! Hi i love the mod. So i did a mod showcase. It is in dutch, but i hope you like it anyway.